This class is for people who are looking for a gentle, hour long yoga class. It is particularly good for beginners but also suitable for people who are experiencing stiffness, injuries or ill-health, or who have done yoga before and are looking specifically for releasing tension and for help with relaxation, or who haven't done yoga for awhile and wish to ease their way back into it slowly. The postures are not too difficult and the focus is on the release of tension and gently persuading the body towards increased flexibility and strength. The numbers are small in this class, so that some individual help is possible. The atmosphere is welcoming, warm and friendly. A gentle yoga class helps to release tension, lubricate joints and release energy blockages, and also improves flexibility and physical tone. Regular yoga develops core strength which helps to improve posture and prevent musculoskeletal problems. Getting the energy flowing helps the body work in a positive and healthy way. This is a great antidote to daily life where our bodies rarely get the full range of movement they need to stay healthy. Especially if practiced regularly, yoga leads to the more subtle benefits that can spill over into the rest of life. One can find stillness, presence and balance, greater patience and equanimity, and an ability to cope better with the stresses and strains of daily life. Ultimately yoga is a way to help foster self-awareness and is a good way to prepare for meditation. For a more complete list of benefits, see Maria's approach to yoga. After a warm welcome, the session starts with simple movements to alleviate tension and to warm up the body. The middle part of the class introduces postures that stretch and strengthen a combination of muscle groups. Students are always encouraged to go only as far as they feel comfortable with and not to strain. 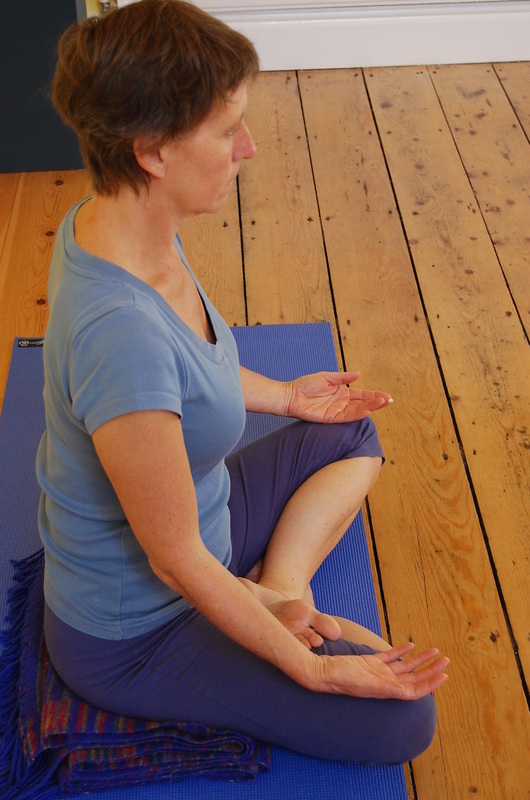 Breathing awareness plays an essential role which helps to deepen the benefits of yoga. The class will end with a short period of relaxation in a final posture called ‘Savasana’. This is the opportunity to completely relax, allowing the body time to absorb all the movements and efforts made during the class. This is probably the most important posture of all – and the most appreciated by students! * Develop presence and balance in daily life through regularly practicing yoga. Please come 5-10 minutes early so you’re ready to start at 11am. If you are interested in coming to a class, contact me to see if there is space or if you have questions that aren't answered here or on the common questions page. If you have a medical condition or health issue please first check with your doctor that yoga is a good idea for you, and let me know so that I can ensure the postures you will do will be safe and helpful. Click on the prices page to see the payment options. If you think the general yoga class might be more suitable for you, please contact me to arrange. Or a one to one yoga session might be just what you are looking for.